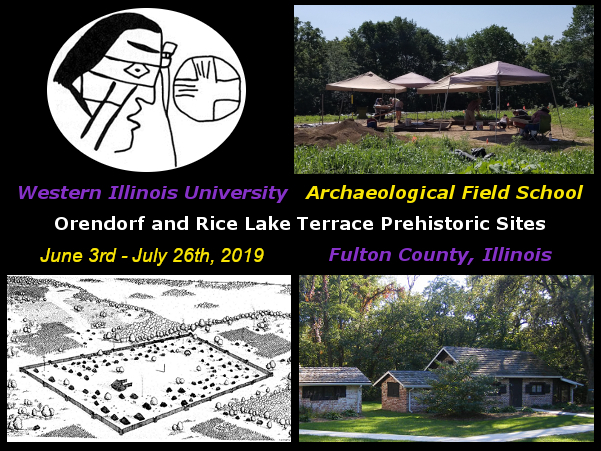 The 2019 Western Illinois University (WIU) Archaeological Field School will focus on survey and excavations at the Orendorf and Rice Lake Terrace prehistoric archaeological sites along the Illinois River in Fulton County, Illinois. The Orendorf site is a world-renowned Mississippian village and mound group located on a bluff top overlooking the Central Illinois River Valley. 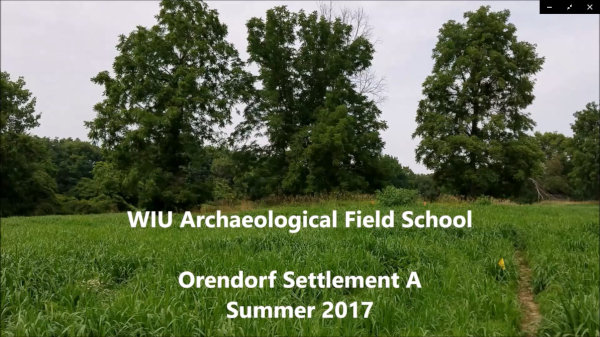 Orendorf has been the subject of WIU excavations since the 1970s, and has been found to comprise at least four distinct settlement sites, resulting from the relocation of the village several times over a period of 150+ years. In the 2019 excavation season we will, for the first time, have access to the previously-unexcavated Orendorf Settlement Area B, which is sure to expand our understanding of the sequence, duration, and character of this Orendorf settlement, relative to the others. Settlements C and D were decimated by fire and abandoned with an amazing variety of artifacts left in place, frozen in time, on the house floors. Whether Settlement B met the same fate will be a major question for the 2019 season. The Rice Lake Terrace site is located below Orendorf on the shore of Rice Lake, an Illinois River backwater lake. This region of the Illinois River was described by the early European explorers as unparalleled in natural resources, with lakes having ducks so thick on the surface that they'd have to push them aside to pass through with a canoe. Rice Lake is still a major destination for duck hunters today, and appears to have been a favorite spot for millennia. The Rice Lake Terrace site has an extraordinary time depth, with Archaic (8000 BC - 500 BC), Woodland (500 BC - 1000 AD), and Mississippian (1000 AD - 1673 AD) cultures represented. Aside from brief surveys by Cultural Resources Management teams, Rice Lake Terrace has only recently been the subject of very limited professional excavations (during the 2017 WIU Archaeological Field School). Field school students will enjoy this rare opportunity to participate in the excavation of such an unusual, multi-component site. Investigating the relationship between the Rice Lake Terrace site and the famous Orendorf Mississippian village, just up the bluff, will be especially intriguing. Although the excavations will be conducted on prehistoric archaeological sites, forensic archaeological field techniques, and special considerations for forensic evidence collection, will also be discussed and demonstrated. * The first and eighth weeks of the session will be conducted off-site (assignments can be conducted online). The first week will involve preparatory lectures and reading, and the eighth week will provide an opportunity for students to finalize and submit their field journals and laboratory analysis reports. The second through seventh week will comprise full days of field and laboratory work (Mondays through Fridays). Transportation: During the six-week field season (June 10th - July 19th), we will drive from Macomb each field day in a WIU van, and will conduct lab work in the (air conditioned) laboratory in Macomb on at least one day (or two half-days) per week (typically on Fridays, unless we’ve stayed in, or returned early, due to rainy or dangerously-hot weather earlier in the week). Lodging: Lodging will be available in the cabins at WIU’s Horn Field campus, on the southern edge of Macomb for the six-week field season (check-in June 9th, and check-out July 20th). The cabins have air-conditioning, bunk beds, bathrooms with flush toilets and showers, a grill and campfire area, refrigerators, microwaves, and free Wi-Fi. The Horn Field Lodge, with full kitchen and dining area, will also be available for most meals. For cabin photos, and more about Horn Field Campus, visit: http://www.wiu.edu/coehs/rpta/horn_field_campus/facilities/index.php. All registered students will also have full access to all of the amenities of the WIU Student Recreation Center for the full eight-week term. In addition to WIU tuition, all students will be required to pay a field school fee of $299.00, which will cover transportation and equipment. Optional lodging in the Horn Field cabins will cost an additional $299.00 for the full six weeks. Students will be responsible for their own food costs, but field school faculty will be happy to work with them to plan some low-cost group meals. Applications must be accompanied by a non-refundable $100.00 deposit, made payable to Western Illinois University. One-half of the remaining balance ($249 for those staying in the cabins, and $99.50 for those with other accommodations in/near Macomb) is due by April 1st, 2019. The final fee payment must be received by May 1st, 2019. Due to logistical constraints, unless your application is not accepted, all field school fee payments are non-refundable. Field School Info Session: Friday, February 8th, 2019, 12:00 CST. Former WIU field school students will give a presentation about the 2017 field season, and will be happy to answer any questions about the upcoming season. Dr. Alveshere (field school director) will also be on hand to address any specifics about the 2019 session. Attend in person in room 453 Morgan Hall (Macomb, Illinois campus) or view the live feed on the WIU Field School facebook page at www.facebook.com/WIUFieldSchool. The video will remain posted for later viewing, as well. It's not too late! Our priority deadline has passed, but we still have some spaces available! Next topic: "Colorado Field School"
Previous topic: "New Mexico State University Fieldschool "